I'm working on an illustrated version of the GTV manual based on Patrick Hayes translation. 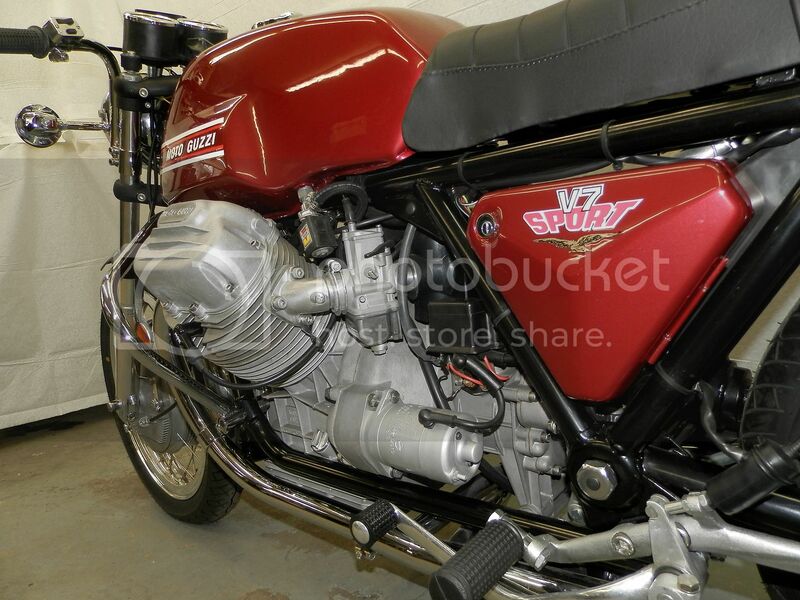 The structure of the bikes and manuals is so similar it might be helpful. I'll send you a copy when finished. 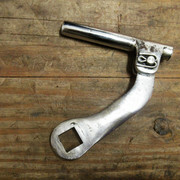 The square hole in the brake lever arm was too large and not quite square. 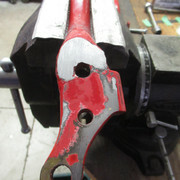 The hole needed to be welded up and redone. Cleaning and inspection revealed a crack in the chrome. 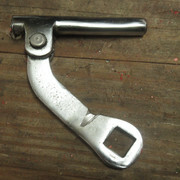 It looked a little too prominent so sanded the chrome off to reveal a crack in the brake arm! Started grinding it out before getting the camera, but the heat drove old oil out of the crack making it visible. Weirdly the crack is on the compression side of the arm so can't figure out how it would form. 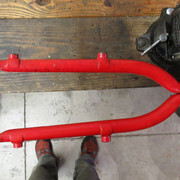 After welding and polishing and filing we have a better brake arm. 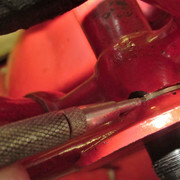 Filed the hole with a slight taper so it would tighten down on the brake pivot. All it needs is chrome... at some later date! 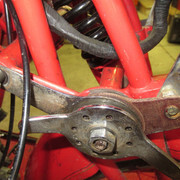 Relined brakes and repaired brake arm feel really good on the bench. Just waiting for sparks to motor around. idle hands are the devil's playground or some such non-sense? Refreshed my failing memory on this thread this morning. Really good stuff, Shaun. BTDT. There's a reason I've mentioned that a few times. 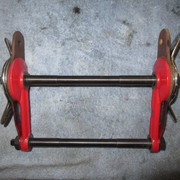 Funny you mentioned it Chuck, the rewound armature came back yesterday. 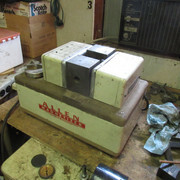 Set it on the lathe and it sparks pretty consistently at 140rpm - only 280 rpm kickstart speed! and it still needs remagnetizing. Took the mag to the magneto guy for a recharge today followed by a little test on the spark gap. 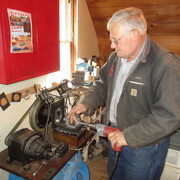 He's got a huge wealth of knowledge about magnetos for everything from 120 year old telephones, make & break stationary engines, drag saws and dynamite igniters (what do you call those things?) - plus your run-of-the-mill trucks and tractors. 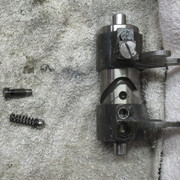 Pull barrel, split cases, 2nd gear engagement OK. Disassembled shifter camshaft checked out OK. Culprit is probably worn pawls in the shifter ratchet that is external to the crankcase. 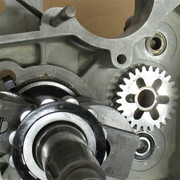 Below: 4th gear on the right. 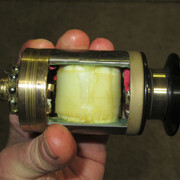 Missing shield is between bearing and spacer with red arrow. 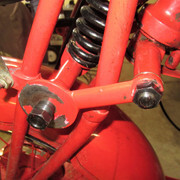 Red arrow spacer is reversed in photo and should be installed flat side to bearing. There is another spacer at the gold arrow. 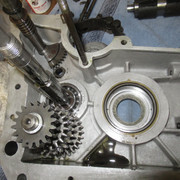 3rd picture shows the shield correctly oriented with recess toward bearing and "red arrow" spacer reversed. 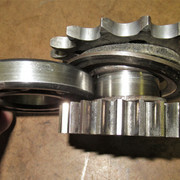 Bearing to be removed is a special narrow size - nearly unobtanium. 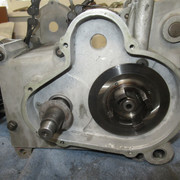 Guzzi peened the case around the bearings to hold them in place. 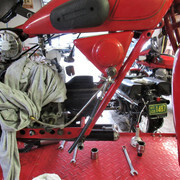 Even the later shop manuals don't mention heating the cases to install or remove bearings. I'd installed the bearing and shield in a hot case but this one was so loose when warm it and the shield dropped out - which is the whole cause of this mess. 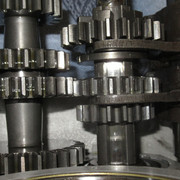 Peening is the only way the bearings are secured. 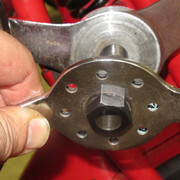 Spacer bearing and shield - the "red arrow" spacer should be installed at the same time as the felt seal as it is almost impossible to get install it after the seal. 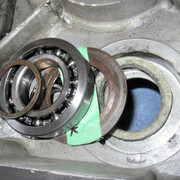 Case should be peened around the bearings securely as it is the only thing holding the bearings in place. Cases almost ready to join. Closed up. 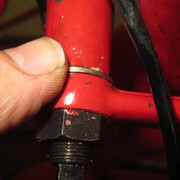 The "red arrow" spacer should be installed with the felt seal even though nothing holds it except the tension of the felt. 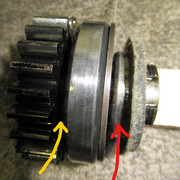 (there is a similar combination of felt and spacer under the roller bearing) If not, the felt will close up enough to prevent the flat side of the spacer from seating against the bearing. Unfortunately I'd not installed it with the felt. Here's my solution: cut 0.005" shim stock and wrap it inside the felt to form a collar. 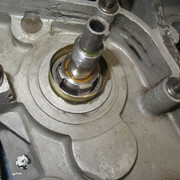 Seat the collar against the bearing. Splay the outer edge of the collar just enough to insert the spacer and push the spacer down to the bearing. 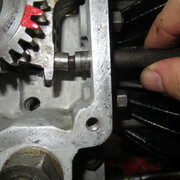 Hold the spacer in place and pull out the collar with pliers. 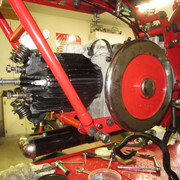 Repaint and install cylinder with new base gasket. 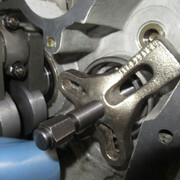 Head on just to clamp the cylinder in place. 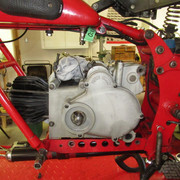 Install drive sprocket, kickstart, clutch basket and clutch, clutch pushrod, clutch springs (compress to 27mm for GTV) and cover. 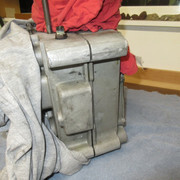 The missing shield story is very similar to the missing oil slinger washer that I found after putting my Alfa motor back together, I chose to take 2 mm of the diameter of the slinger so it could go through the hole for the front oil seal instead of taking the engine completely apart again. Hopefully it won't make a difference if the washer is 50 or 52mm in diameter. Looking forward to follow the rest of your process! 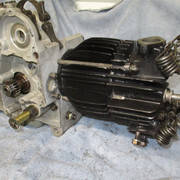 The reason for pulling the primary cover was to replace the generator drive gear. 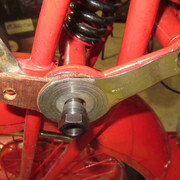 It had been replaced by a Falcone alloy drive gear - but to make it fit the hub had to be cut down to a small diameter and i promptly cracked. 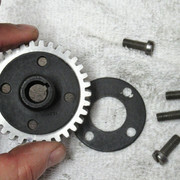 The Falcone must have a much larger hole in the case for the drive gear hub. 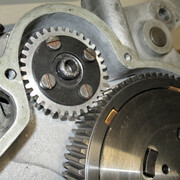 The correct GTV drive gear has a steel hub of much smaller diameter. 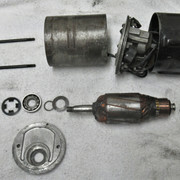 Guzzi Retro had a kit with hub and alloy gear (original was a phenolic gear with a bad reputation for stripping on startup). It's only $$$. 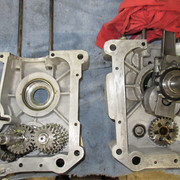 All alloy Falcone gear and correct 7(!) piece GTV gear. 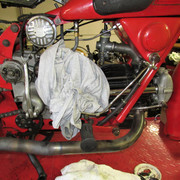 But first I had to replace the drive end bearing with one from Guzzi Retro. 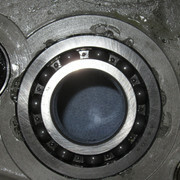 Bearing is an E13 or N13 same as the magneto bearings. 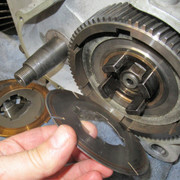 The brush end of the generator has a smaller bearing. Also made a new leather seal to fit between the endplate and the bearing. 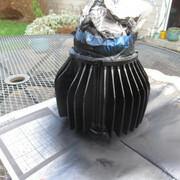 I'd already replaced brushes and regulator and cleaned up the innards. 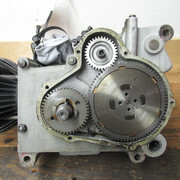 Correct gear mesh is achieved by rotating the generator in its cradle - though this one also needed a spacer under the gen. Just visible in the the 3rd picture is a rubber seal (rectangular section O-ring) between the gen endplate and the crankcase. Put it in the frame before it gets too heavy! Glad you find it interesting! Definitely a weird machine. Timing gears and magneto on next. Check the gear mesh. 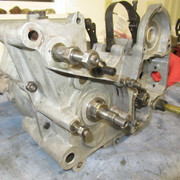 The exhaust valve train was noisy when running, couldn't find the cause. 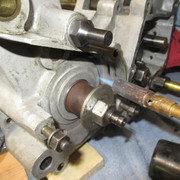 Assembling the valve train without the pushrod tube allowed wiggling of all the parts and revealed an oversized cup on the exhaust cam follower. It was sold to me to replace the original that was cracked (probably cracked when the pushrod bent...) - so likely the wrong part. 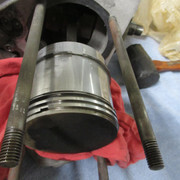 Do later pushrods have larger ends? Fortunately I had bought a second that was the right size. Swapped them and no more slop. 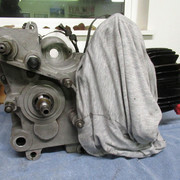 Hopefully the engine is quiet as a mouse now! 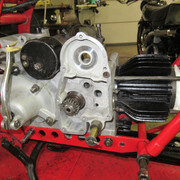 Cover on, fill cambox with oil, then install pushrod tube and rockerbox. 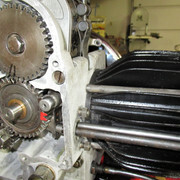 Hoping the rewound mag gives easier starting, consistent idle and eliminates banging on the overun. 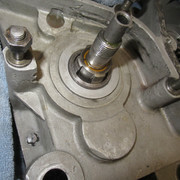 And the noisy valve is solved. Maybe find out tomorrow! Fingers crossed! Please keep us posted. Yes Fingers crossed from here too! And make us a video! Yesterday - ready to try to start. 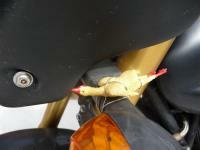 There was very little old gas in the tank, but the old Dellorto flooded anyway. It eventually started but ran terribly. Couldn't tell if it was getting too much or too little fuel - though the plug was black. Got a couple gallons of fresh gas this morning and put on a Mikuni that had worked OK. 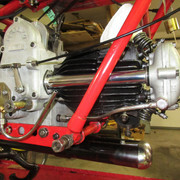 It started but was way out of adjustment - idling too fast and too rich. Finally got it down to a stable idle. 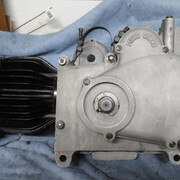 It would start easily and idle smooth. 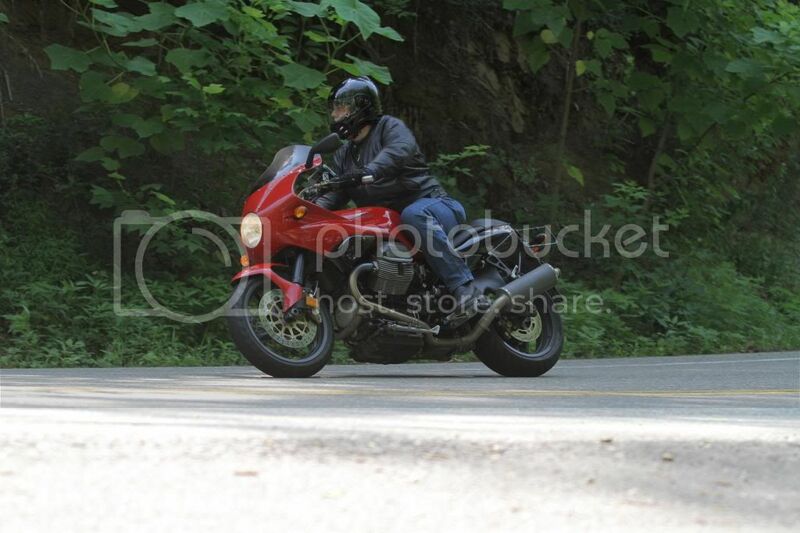 So went for a test ride. 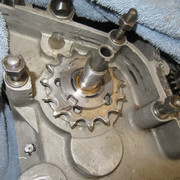 It popped through the carb a couple times until warm then ran just fine. Never banged in the exhaust, or pinged or coughed. Idled fine at the stops. Shifted cleanly and never jumped out of gear. 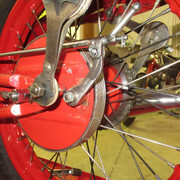 Brakes still very feeble (a design feature! ), but more feel and no more squeaks. 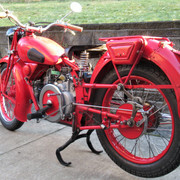 New tires and rebuilt rear wheel roll smooth and track straight. It doesn't rev very high, but pulls strongly. Rode it about 10-12 miles up to 50 mph or so. Congrats! Quite an achievement and a testament to stick toitevness.. I don't remember why it's off by a tooth? No, timing was correct, this is for gear mesh. 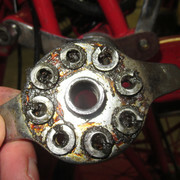 This bike came with a shim under the mag (old Italian cardboard sparkplug chart) and the parts books for later slicers show a shim under the mag. I didn't expect the dynamo to need a shim because it can be rotated in its cradle, but even it needed a shim - so I was looking for it when I got to the mag. I'll take a video in the next day or two. Love what you have done with this beauty. OK here's the video of the cold start today. 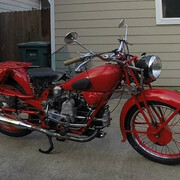 Rode a quick 11 mile loop and still need to sort out some carburation, but definitely working well (for an 80 year old moto). Love it! Makes me want to find a slicer for myself too! It doesn't only look good from 30 feet, it looks like it looks good up close too in that video. 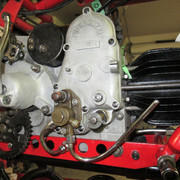 And I love the valve train too! Also, label your video so people can find it with the search function. I'm sure there is other people who would love to watch the video but don't subscribe to this forum. The exposed valve springs and rockers moving back and forth along with the spinning flywheel and the great engine noise / exhaust note make for one heck of an impression. Awesome progress, thanks for sharing that video! So cool. Fantastic! Seems to perform very well! Looks so much like a local ride around here (I'm on Vancouver Island). I'd love to see it in person, some day. The official name, here, is Strait of Georgia, but Salish Sea is also commonly heard. I'm usually down in your neck of the woods at least once or twice a year. I'd love to stop by and have a look at your slicer when in that area, sometime. In the meantime, I'll continue to watch this thread to get my fix. For a long time the rear end of the Slicer has looked caddywhompus. 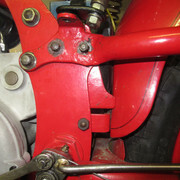 The rear frame arms (seat stays) don't align with the swingarm dropouts - most obviously when installing the rear friction dampers. Despite the skew it is possible to align the wheels and the bike seems to track straight. 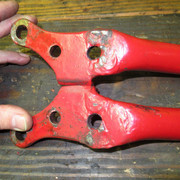 Probably the rear frame arms were bent so pulled them and found they had been welded and not cleaned up. Of course they'd been painted. 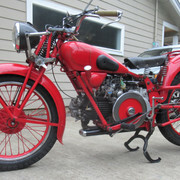 Someone disassembled and painted the entire bike (except the wheels) then pinstriped it, but they didn't bother to clean up welds, repair worn out parts or even fix leaks in the tanks!!! Even the horizontal pinstripe on the tank top is crooked. 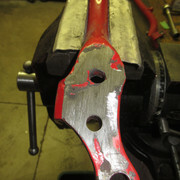 Bumpy weld continues over to the mating surface. 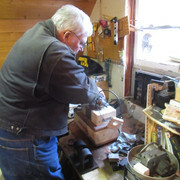 Clamping the arms together shows the splay. 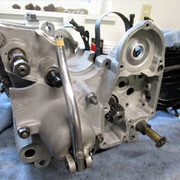 All that was needed was to level the mating surface. 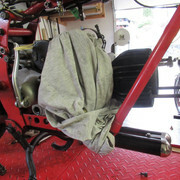 Swingarm alignment will need to be checked when I remove it, but it measures up pretty close and the frame and swingarm are in better alignment. Easy fix! Yeah - Let me know! 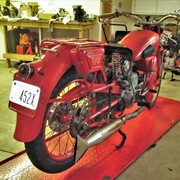 Also our club is putting on a classic motorcycle show and swap April 27 at the Lynden Fairgrounds. Might be a good time to visit. I saw that! Will make it if I can. Pulled the pin(s) Is that still a thing? maximum play in pivots due to wear = 0.10 mm (0.004”) From Alce and Sport 15 shop manuals. 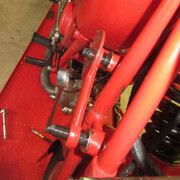 Width of girder and steering head at upper and lower pivots is 167 mm. 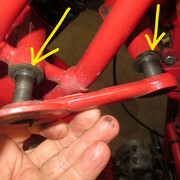 The bushings were egg shaped and the pivot pins quite worn. 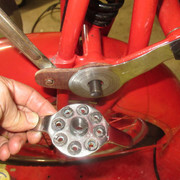 New pins were too large for the bushings so gave the opportunity to restore the bushings by reaming to fit. Only weirdness was that the shoulders (yellow arrows top fotos) on the new pins were 6mm wide. Original is 3mm with so the shoulders either required thicker spacers or had to be cut down on the lathe. I cut them to 3mm. 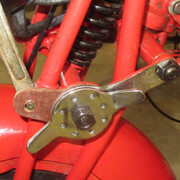 If the girder and links are true, the trick to setting up a parallelogram fork is to reduce the end play on the pivot pins to zero without locking it up. 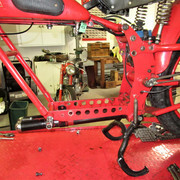 Install pins from the left and install the 4 bronze thrust washers. Thread the pins into the right link until there is little end play. 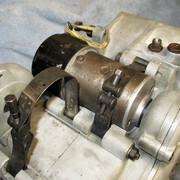 (a ratchet strap can compress the mainspring if needed) Install and tighten the left link and check that at least 1 bronze washer on each pin can be turned (i.e., pin is not locked up). 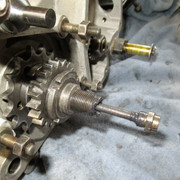 Then tighten the nuts on the right link. 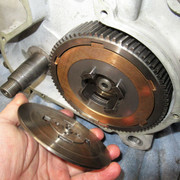 Again, check that one of the bronze washers can still be rotated. 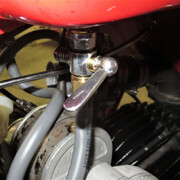 If not, loosen the nuts at both ends and unscrew the pin a little from the right link. 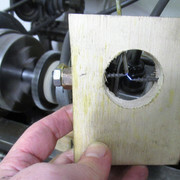 Repeat until the play is taken up and nuts on both ends of each pin can be tightened without locking up both bronze washers. 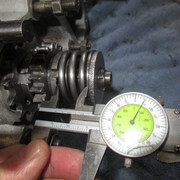 Guzzi manuals state that 0.1mm (0.004") is the maximum permissible slop in bushings or endplay. Once endplay is adjusted the left side nuts can be loosened and the damper plate and friction material placed over the ends of the pins. 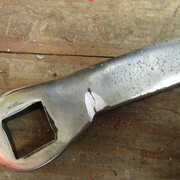 Thread the wingnut all the way onto its nut. 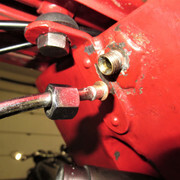 Hold the 8 little springs with dabs of grease and thread the nut onto the pin. 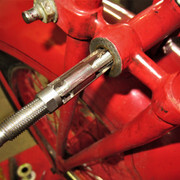 Tighten both left side pivot pin nuts, then tighten the wingnut against the damper plate. Repeat for the right side. 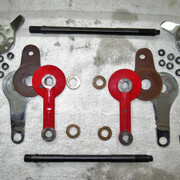 Once both sides are complete confirm that at least one thrust washer on each pivot pin can still rotate. 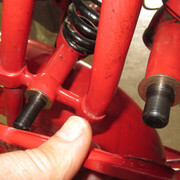 Adjust damper wingnuts to road conditions and speed.